INF is again in mourning after the passing of Philip Gurung in the early hours of Monday morning, December 7. Philip’s wife, Maili, had passed away 18 days ago. What a great story of love and service this amazing couple have lived as an example to all who knew them. Philip and Maili had served INF since its fledgling beginning as the NEB. As a teenager living away from his native Nepal in Nautanwa [a small town on the Indian side of the Nepali/Indian border] Philip picked up what he thought was a piece of gold and tried to test it by lighting fire to it but it exploded in his hand. He sought medical attention at the local dispensary run by Pat O’Hanlon and Hilda Steele. Though Pat treated his wounds he lost some of his fingers in the accident. 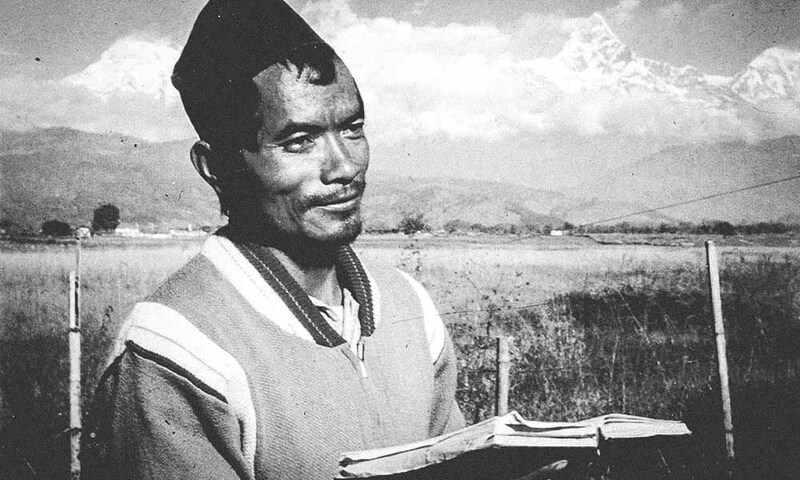 As a result of this meeting Philip soon enrolled in the school Pat and Hilda ran for Nepali boys, and in response to discipleship given through Pastor David Mukhia, Philip gave his life to Christ and was one of the first believers baptised in the small Nautanwa church in 1941. He wanted to be an Indian soldier but the Lord chose him to be His soldier. He came to Nepal with Buddhi Sagar to prepare the place for the NEB team before they arrived in Nepal in 1952. One year later he married Maili and continued living in Pokhara. Philip started working alongside Pat at the Shining Hospital and would often accompany nurses on their treks to the villages of patients cured of leprosy, acting as an advocate to try and encourage the village chiefs to accept the patients back. He is recognised as a pillar of the Church in Nepal, especially in Pokhara where he played an integral role in the growth of the church, and was known for his love of scripture. In recent years he could be seen each day sitting on his porch reading his Bible for most of the day. Philip is survived by 6 of his 7 children, 16 grandchildren and 4 great-grandchildren. His life and service to the Church in Nepal was celebrated on December 8 with a funeral service at Ramghat Church, Pokhara. PRAY | GIVE | GO | SHARE – Please give thanks for the lives of Philip and Maili and pray for comfort, peace, and strength for their family.